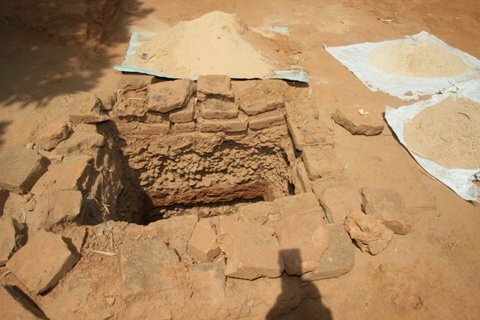 A nearly intact vestige of an ancient Cham tower has been unearthed in Phong Le village in Cam Le district of Da Nang city. Archaeologists from the Cham Sculpture Museum of Da Nang and the Archaeology Faculty of the Hanoi-based University for Social Sciences and Humanity said that the tower was built in late 10th century or early 11th century. The vestige is detected at the depth of two meters. A VietNamNet’s correspondent visited the site in the morning of August 23. The excavation hole is 4.25m long, nearly 2m deep. Archaeologists said they have dug up over 30 cu.m of soil from the hole. Mr. Nguyen Chieu, from the Archaeology Faculty of the University for Social Sciences and Humanity, said that Cham people built the foundation by pressed sand and gravel so their high tower could not collapse. This is Cham people’s secret in construction. Director of the Cham Sculpture Museum, Mr. Vo Van Thang, said this is the largest Cham tower that has been discovered in Da Nang. Experts said that the 16x16m tower has one main door and three smaller doors. They have defined the size and the position of the altar. Da Nang authorities have asked relevant agencies to keep excavating the site and restore it. Excavation at this site began in mid-2011.